I first noticed this place while driving through Chandler, AZ in the evening. It stood out due to the brightly lit interior, large crowd, and bright “Baguette Factory” sign inside. During discussion with my parents, they mentioned that it’s one of their favorite lunch spots, so we decided to go there for lunch on my way to the airport. The menu here has two sides, “Euro” sandwiches (a variety of ham and other cold cut sandwiches) and “Asian Sandwiches (mostly Vietnamese style sandwiches, such as a Banh Mi). 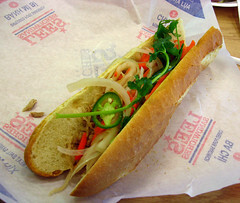 I opted for a Banh Mi Bi (at right), which is generally one of my favorite sandwiches. My parents opted for ham sandwiches from the Euro menu. The iced coffee is quite good, done in the Vietnamese style (with plenty of dark drip coffee and sweetened condensed milk). Apparently, during the week you can get some nice fresh cream cakes, but this isn’t the case on Sunday morning. 2. This is also a good place for a very good cup of iced coffee, or if you need to pick up a cheap baguette. 1. I’ve had much better Banh Mi sandwiches, and many that were more generous, but this one was fairly tasty, and since it only cost $2.45, I’ll give it some credit. I really enjoy Lee’s. I definitely prefer the croissant to the baguette though. Their drinks are very good too. They have such an interesting selection, it makes me want to keep going back. One of the things I enjoy about visiting more metropolitan areas than my own is seeing the food fads that show up in particular cities. Like the sudden resurgence in fruit juice in 2013, or 2015’s bone broth craze, or the still-with-us circa 2005 cupcake craze (we’re past Peak Cupcake, but there are still a lot more cupcake places about). In Seattle, one of the 2016 trends was poke: the Hawaiian dish made from cubed, raw, marinated fish served over a bed of rice with a selection of toppings like garlic, the infamous “krab stick”, edamame, ginger, and various seaweed products. It’s actually a dish I rather enjoy (or, more usually, the closely related Japanese-inspired donburi, which is more common out my way). But it was definitely one of the current food trends in Seattle, since during our march we saw no fewer than a dozen places advertising their poke. And there were few better examples of the craze than the 45th Stop N Shop Deli.